Recently I’ve watched a great video guide on a sidestroke and realized I’ve completely forgotten about it planning our blog posts. It is not only me who did that as there’s very little on that subject on the internet. One of the possible reasons is that it is not a competitive style other might be that its particular use cases are very narrow and we can call sidestroke a niche style. But does it mean we don’t need it? There are few types of swimmers who would strongly disagree so let’s look at the reasons why some groups of professionals wouldn’t be able to do their jobs without the sidestroke. Sidestroke is an ancient swimming style that was born out of the realization that swimming breaststroke with your head above the water was very ineffective and tiring. 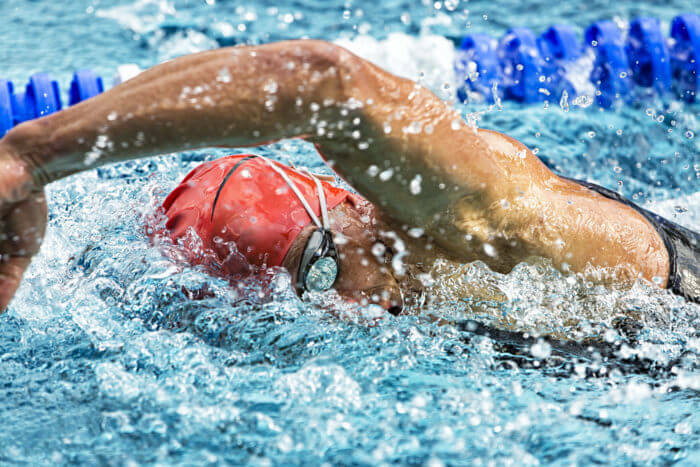 Sidestroke gets its name from the fact that the swimmer lies on one’s side with asymmetric arm and leg motion. The hands act like oars and do not waste any power by oblique action. The legs move in opposite directions with legs bent and straighten as they come together. The kicking motion is exaggerated and slow, opening the legs wide to provide more thrust rather than the small, fast movement of the flutter kick. Sidestroke is used for towing casualties by lifeguards all the time. Lifesavers don’t use the right arm because they would pull a casualty with it. It is irreplaceable as it allows to help people that are hurt, immobile or unconscious get to the waterside. Towing casualties is also incredibly taxing and requires immense strength and technique form the brave lifeguards all around the world. Sidestroke helps with that being extremely efficient and perfect for difficult and long distance swims. You must admit – that is a very important use case as it literally saves lives. Sidestroke is such a great way to move through the water efficiently that the most elite water forces Navy Seals decided to create their own modification of it to train and use it during missions. Those soldiers are the best swimmers in the army and some of the best endurance swimmers in the world so it is a proof that sidestroke is a perfect choice in extreme situations when your speed to efficiency ratio is crucial for survival and success of the mission. CSS or The Combat Side Stroke developed for Navy Seals gives you speed, low strength drain and smooth profile making SEALS less visible and harder to detect in the water. The modified version of the sidestroke allows swimming just under the water surface making it perfect for covert-ops or missions behind the enemy lines. As you can see, this weird and funny looking style of swimming is, in reality, a super-stroke used by our amazing lifeguards and by the elite Navy SEALS teams. Try it sometimes and see how long of a distance you can swim using sidestroke! Fully automatic and accurate with and without professional turns. Set your goal and swim at a predefined pace. Smart vibrations will tell you when you need to speed up or slow down. Stay in your chosen heart rate zone and burn calories more effectively. Smart vibrations will let you know when you need to push yourself harder or slow your pace down. Swimmo communicates specific actions via unique vibration frequencies. 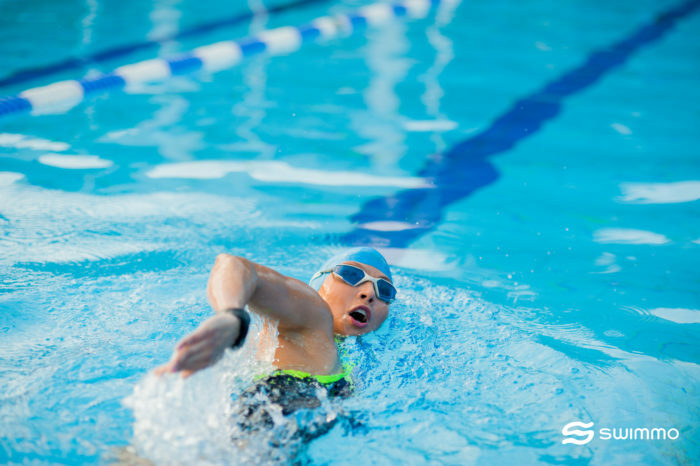 Using Swimmo App you can quickly create your own training goals that are best suited for you and your needs. Sync them wirelessly to Swimmo watch from your smartphone. Simple charts and detailed views of the training sessions are always with you in a dedicated mobile app for Android and iOS. Advanced algorithms based on pulse deliver more accurate data about calories you’ve burned. Designed to be easy to use in the water. You don’t need to press any buttons to use your Swimming Training Watch. Simply rotate your wrist and tap the screen to gain full control over your watch. Share your swim data with your friends via Facebook and other fitness apps. Compete, compare, and cheer each other on.